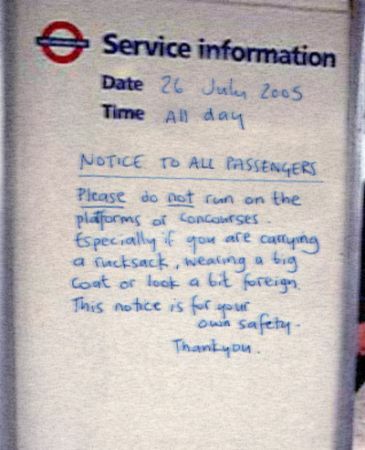 Apparently snapped at Notting Hill tube station yesterday. Been setting up a website for Reclaim the Beach. Based in WordPress, which one of these days I’ll convert this home spun blog into. I want to use the improved interface, the fact it links up with lots of other web things like Zoto and Del.icio.us (although I already kinda integrated that. I think it is the temptation to see if anyone will leave comments, trackbacks etc. I also set up a festival blog for A-non tshirts. They haven’t quite got the grasp of it yet. Need to find a more userfriendly way for them to upload photos. Which is what I am starting to like about Zoto.